The vehicle’s stripped-back design and lightweight materials mean it can be assembled by one person in four hours, the firm behind it claims. The vehicles will be “autonomous-ready”, for when self-drive legislation is in place, the firm said. “We find trucks today totally unacceptable. Loud, polluting and unfriendly,” said Denis Sverdlov, chief executive of Charge, the automotive technology firm behind the truck. 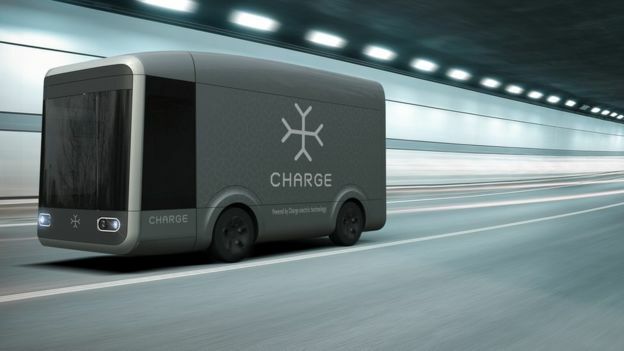 The self-drive software has been developed in-house and is ready to be uploaded to the trucks “at the touch of a button” whenever the government allows autonomous vehicles on UK roads, the firm said. The firm is an official partner of Formula E – the electric car racing competition – with its trucks being used for the drive parade and for logistics on and off the track. Most of the big car manufacturers are making big strides in developing electric vehicles – Volkswagen, for example, is planning to launch 30 all-electric models to reposition itself as a leader in green transport following the so-called “dieselgate” scandal. Driverless cars are also becoming a reality. The UK’s Transport Systems Catapult test-drove an autonomous vehicle on a public street in Milton Keynes this summer, with further trials planned for London soon.